Check out Tobi's Adore Me Drape Cardigan Shake off that autumn chill in the Adore Me Charcoal Drape Cardigan. This cable knit cardigan features an open front, thigh high construction, bubble sleeves cinched at the wrist, and cute side pockets. This statement sleeve cardigan will complete any fall outfit, but you're gonna love it best with a corduroy skirt and mock neck top. 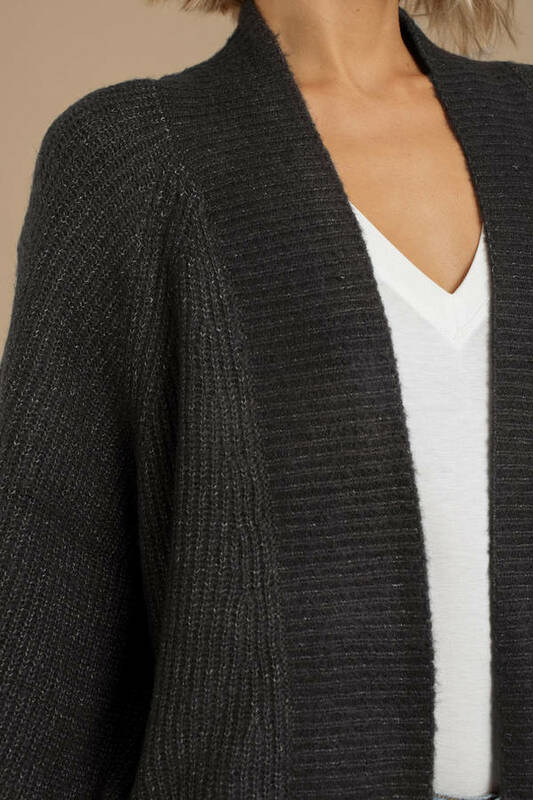 Shake off that autumn chill in the Adore Me Charcoal Drape Cardigan. This cable knit cardigan features an open front, thigh high construction, bubble sleeves cinched at the wrist, and cute side pockets. This statement sleeve cardigan will complete any fall outfit, but you're gonna love it best with a corduroy skirt and mock neck top.